Over at Amazon, this Bosch 12V Max cordless drill and impact driver combo kit is on sale for just $99. That’s a buck less than a hundred for a drill, impact driver, charger, (2) compact Li-ion battery packs, and a carrying case. Both are solid tools, and despite being quite long in the tooth, I’d highly recommend them. No, neither tool is brushless, but they’re capable and reliable. Here’s my old review of the PS21 screwdriver and PS31 drill/driver. While I haven’t formally reviewed the PS41, I ranked it as the “best budget 12V impact driver” in my best cordless impact drivers roundup, which I’m currently in the midst of updating. There are tradeoffs, with these being older tool designs, but I can’t think of anything that a refresh could offer that would improve upon these. Bosch has newer brushless models, but you’ll have to spend around $288 to get the brushless drill, impact driver, a charger, and 2 battery packs. This is a great deal for anyone looking for 12V-class drill and impact driver sidekicks, or for homeowners looking for their first tools to tackle DIY projects. It’s unclear as to how long this promo pricing will last. A search shows that some other Bosch dealers are also offering the deal. Its regular price, going by Acme Tool’s pricing, seems to be $169. Update: As DaveVB points out in comments, this item is only for Prime Members. It seems that you can’t buy it from Amazon directly if you’re not a Prime member. If you’re not a Prime member, there’s the option for a free Amazon Prime trial. There’s also one 3rd party seller with a $106 price, and some other non-Amazon retailers who also have it for $99. « What About Craftsman Cordless Power Tools? I have an older version, perhaps from four years ago, and love both these tools. They are a great size for working inside cabinets, though I use them for other jobs, too. Lighter means less fatigue for repetitive drilling/driving. I’ve used them more than any other drill/driver and would definitely buy again. Being a 12v, they don’t have the power of an 18v or greater drill, but they don’t seem underpowered, either. I’m just curious about the updated versions. What improvements have they made over the previous models? From what little research I was able to do, it looks like there aren’t a ton of improvements. The brushless drill has the same power (265 in. lbs) as the brushed drill. The impact improves from 930 in. lbs on the brushed to 975 in. lbs on the brushless. Other than better runtimes, it doesn’t look like there have been a lot of improvements to them. Seems like very slight to no improvement depending on the tool in question. Stuart, I know you haven’t used this one, but thought someone else might know, or you might have run across something. Brushless improvements? Mainly a little smaller and I believe a boost in runtime. I haven’t done performance comparisons, but was told that the goal was for the brushless tools to perform just as well as the brushed motor versions. The brushless impact also has more than 1 speed range. There has NOT been any newer brushed model versions. It’s PS31 for the drill, and then PS32 is the brushless drill. PS41 for the impact driver, PS42 for the brushless impact driver. This drill driver hasn’t really changed in years (doesn’t need to) and batteries in this thing last foh-ev-ah! It’s my go-to, tag-along drill. 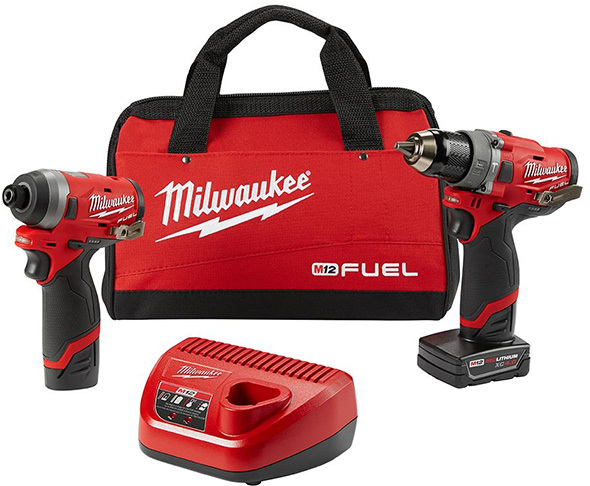 I have the Milwaukee 12V set that I bought at the same price point (with three batteries). If I didn’t have that set I would buy this one. I had this same bosch set and it’s great BUT it has no belt clips….. i sold it and moved to the milwaukee simply because it had no belt clip. But now i’m really glad that i did sell it as the milwaukee 12v line has ended up being much better. I’m not 100% certain but I would suspect that the “prime member only” thing is temporary. I’ve seen this several times with other items that I wanted to order that were “prime member only” for a couple of days and then went back to being available to non-prime members. I’m not a prime member and honestly find this a bit annoying when they do this……but I can wait a few days for things to go back to normal. Definitely a good deal. I like the set that I have a lot. I’ve seen it on other tools for extended times, but have not seen it enough for any kind of reasoning or pattern analysis. Looks like Lowes still has this on sale for $99 through 6/21. That might be an option for people who don’t want to deal with the “prime only” stuff with Amazon right now. I got this deal last week at Lowe’s, as my Father’s Day gift to myself. It goes along well with my Bosch 12V Multi-X. What this article doesn’t mention is that it comes with 2.0Ah batteries, not the baseline 1.3’s. That makes it an even better deal. However the 30 minute charger has been discontinued, supposedly (according to Bosch) due to some new EU power regulations, so it comes with the 60 minute charger. There are other kits still out there with the 30min if you look around, but the supply is drying up. With 3 batteries, I don’t really miss the 30 minute charger, but it would have been nice… hopefully they’ll bring it back again in compliant form. I left out mention of the battery size because it was unclear to me whether they’re 1.5Ah packs or 2.0Ah. I didn’t want to guess and get it wrong. Someone asked that question on the amazon page and this is the response from Bosch. Thanks! That’s reassuring. There still might be a chance of receiving older stock, but having that Bosch answer on the page might make it easy to request a return and replacement. This is similar to the Bosch tool set I bought 10 -12 years ago that sold me on Bosch. I’ll echo what was said above. They are a great size and fit in some places other drivers won’t. The batteries seem to last much longer than any of the other drill drivers I have had. If mine were to be lost/stolen/die/whatever, I’d definitely buy again. Hmmm – do I need a second pair? Ordered it . 150 in Canada. Thanks for the heads up Stuart. I needed batteries . And a 12v charger . Basically got the tools and a bag free . I’ve got an old PS20. Is it worth upgrading to this kit? Also thinking about getting a PS82 Impact Wrench as long as I’m into this Bosch 12v system. The PS20 is a screwdriver. If you ask me, the PS21 is a great upgrade, and brushless PS22 is likely even better. I don’t remember if I ever did a PS21 vs brushless PS22 comparison. 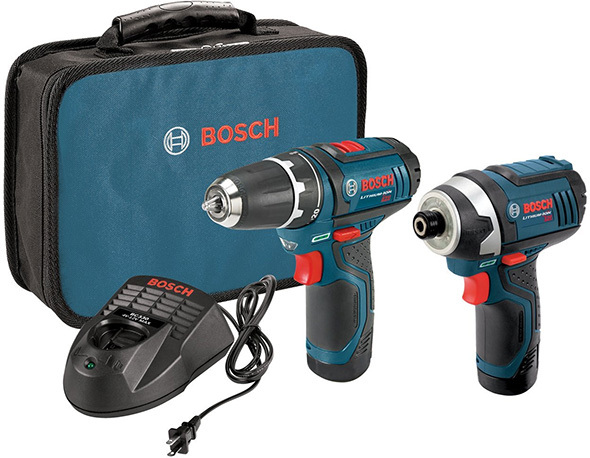 I’d say maybe wait for the Flexiclick – https://toolguyd.com/bosch-12v-flexiclick-drill-driver/ , which looks to be a hybrid PS21 and PS31 plus added adapters. PS82 – well, do you need/want a compact impact wrench? Seen this post and told myself that’s what i need !! Happen to be at lowes today and seen this was marked at 169.00 ( could have been miss-marked ) but lowes will match online prices – took it to the check out and it rang up 99.00 – sweet deal walked out a happy tool guy!! thats another topic of tool carry…… I have all my tools ( at least what i like to carry to jobs ) in a rolling pelican case and inside i keep tools in klein pouches and lid organizer. need to send a photo and write up and see what everyone else does !! I’d love to see what your Pelican case looks like! Lid organizer? Is it a 1510? I will snap some pictures later tonight and send them to you ! I’ve found Lowe’s to be very good about honoring offers and giving discounts.